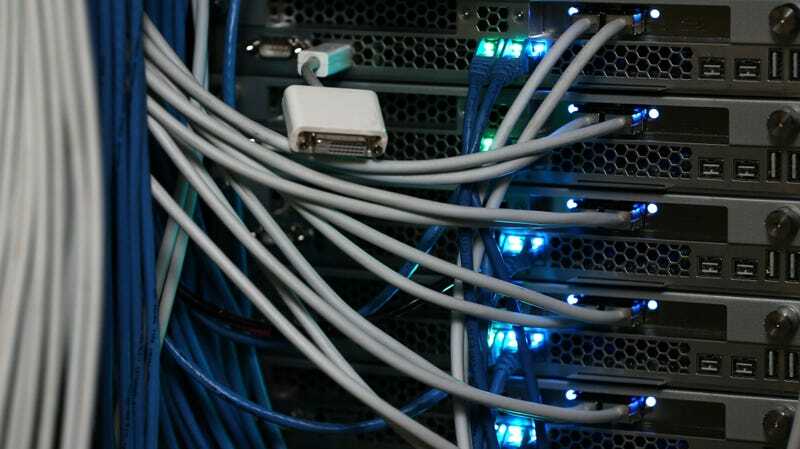 Networking cables in a server room in New York (stock photo). A report earlier this month from Bloomberg Businessweek alleging 17 unnamed sources had confirmed Chinese spies infiltrated the supply chain of microchip manufacturer Super Micro, installing tiny espionage chips that allowed them to wiretap systems belonging to almost 30 U.S. companies, has earned denials from Homeland Security, Apple, and Amazon. Now executives from Super Micro and Amazon are following Apple CEO Tim Cook’s lead and publicly demanding a retraction of the story, the Verge reported Monday. Apple has repeatedly denied the story, including in letters to Congress. Cook told BuzzFeed News there was “no truth” in the story last week, saying “They need to do the right thing” and retract the piece. Now Amazon Web Services chief Andy Jassy as well as Super Micro CEO Charles Liang have issued similar calls. Super Micro’s stock plummeted following the original story. Just as likely however is that Bloomberg’s reporters made mistakes in their reporting and the organization failed to adequately fact check the article. Or that they stumbled on an intelligence misinformation campaign and have been effectively reporting its effectiveness within certain groups of people. No physical examples of the allegedly bugged equipment have yet turned up. The original report seemed to match up with other concerns from Western governments and companies that Chinese manufacturers could be compromised by intelligence operatives. Best Buy, for example, stopped selling Huawei devices earlier this year, and Chinese companies may be shut out of bidding on U.S. 5G network expansion contracts. U.S. lawmakers have also warned that networking equipment produced by Huawei and ZTE pose a national security threat, though the companies involved have denied the allegations. Chinese hackers allegedly stole trade secrets from U.S. companies for years before a 2015 international agreement seemed to cool the trend. (According to Axios, CrowdStrike co-founder Dmitri Alperovitch said the cyberattacks seem to have picked up again starting last year.) But many of the more recent allegations have come at a time when Donald Trump’s decision to start trade war has already strained relations with China, and the primary short-term impact of the espionage allegations has been to add fuel to the fire. In that sense, it’s been difficult to separate accusations founded in truth from those that may be bluster.